There are many ways to represent fractions. The one I see most frequently is a circle. It becomes quite cumbersome to cut a circle into 25ths. I prefer to have my students work with rectangles or squares for fraction exploration. I also see great value in making math fun and engaging with hands-on activities. Who Ate My Cake? is a play dough fraction exploration. These are real world applications. I know I've had people get into my snacks or treats at work. Let's use this situation for some exploration. Use the following prompt to begin. Jenny loves parties. She decides to plan a party for her 5 friends at school. Jenny bought a cake and placed in the fridge at 9:00 am. At noon, she saw that someone ate part of her cake. She was upset and planned to make that cake stealing monster pay her back. The cake cost $12. Notice that this problem doesn't have a prompt to solve. I recently attended a math conference here in Idaho where I enjoyed a class about having mathematical discussions with your students. Use the above problem story to strike up conversation about the cake. Read the passage three times. After the first read, have students identify important math parts. The next reading, clarify any unknown vocabulary. On the final reading, ask for ideas as to questions that could be answered as a result of this story. Try to anticipate some responses and know that some will be way off base. Your job is to guide the conversation. How much does each slice cost? How many hours passed from when Jenny put the cake in the fridge and noticed the missing pieces? Have students select a question to work on in groups to discuss how to solve the problem. Allow groups to be assigned the same questions so that you can discuss the various ways students arrived at those answers. 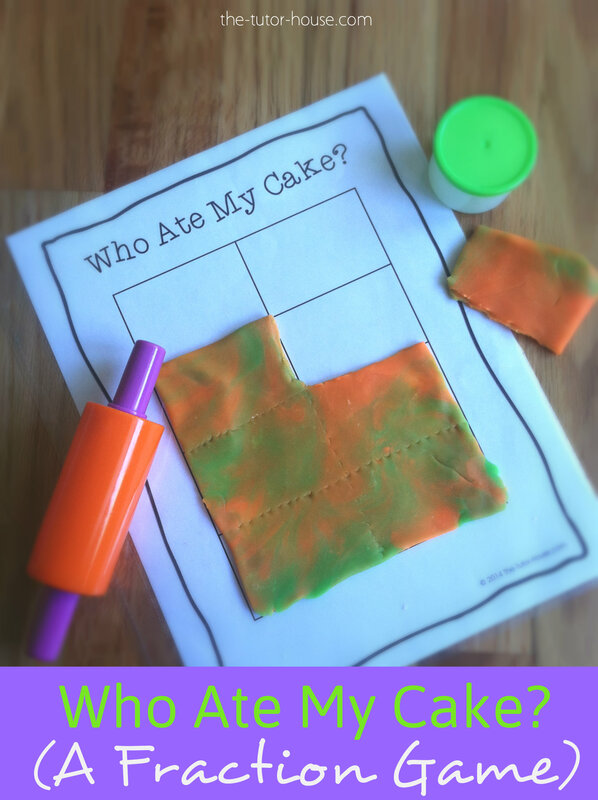 Explore more by using these play dough cake mats. Slide the mats into sheet protectors. Divide students into groups of 2 or 3. (This also can be done as a whole group using a document camera) Students can take turns being the “cake stealing monster”. Roll your play dough out on top of the mat to make the cake. It needs to cover the whole “cake” The members of the group that are not it, close their eyes while the cake monster decides how many slices to “eat”. They then cut out slices using the lines on the mat for guidance. They can squish their play dough they cut out and squish it together to hide the evidence. The monster then gets to ask the questions below. The other two do the work. After all the questions have been answered. It's time for another student to take a turn. They can select another mat to do different fractions as well. What is the numerator for the portion left? If the cake cost $12.00, how much should that person pay me for the portion they ate? With the remaining pieces, how should I cut the cake now so I can feed 6 of my friends?